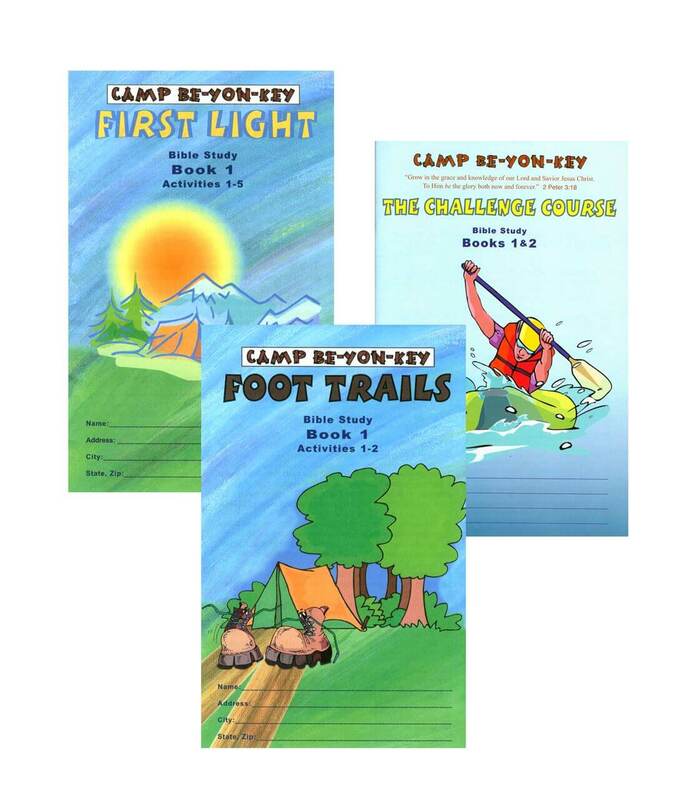 Going to camp is such a GREAT adventure and CAMP BE-YON-KEY is no exception! You'll be challenged to stretch your knowledge of God's Word to new heights! Bible verses are taken from the New King James version; however you may use whatever Bible you have. Our "FIRST LIGHT" study is designed with a camp theme that includes a cabin leader, camp stories, Bible teaching, games, puzzles, and much more! This study has two books to complete and is a great way to help you learn about the New Testament. FIRST LIGHT Subjects: Jesus and His Ministry, His Disciples, His Parables, His Miracles, His last week on earth, Jesus and the cross, His resurrection, and Ascension; the Early Church and the Journeys and Letters of Paul; the Books of Hebrews, James, 1&2 Peter; the Writings of John; Heaven and Hell. After completing First Light, your second study at camp is going to stretch you a little more, yet be great fun too! After a healthy breakfast, your cabin leader heads for the woods as you follow behind. Your Counselor made sure you wore hiking boots for Foot Trails. You're wondering where you are going. What's up ahead? Foot Trails Bible study will help you continue your walk with Jesus. FOOT TRAILS Subjects: The Bible, Creation, Salvation, and the Church. Life can be full of challenges and hard decisions. "The Challenge Course" will give you great Bible truths to help you make good decisions. CHALLENGE COURSE Subjects: Right or wrong, friends, temptation and prayer. To take this Study ONLINE, click here!